Hawking is a documentary feature telling the story of Professor Stephen Hawking. In fact there are several stories here, each of them totally compelling in their own right. We have the account of his growth toward genius and the authoring of his two groundbreaking theses. Then there is the tale of the unlikely best seller ‘A Brief History of Time’, the fascinating developments surrounding the technology behind that famous voice and of course, underneath it all, the heartbreaking story of his illness. All in all this guy has had a very interesting and inspiring life. This clearly could have been great if adapted into a straight drama but actually it needed to be a documentary for two reasons. First of all his tragic physicality is now such that it would be impossible for any actor to convincingly portray him. Benedict Cumberbatch did play Hawking in a 2004 TV movie that chronicled his early life, the film briefly featuring in this documentary, but that is only one part of the story and for many different reasons, positive and less so, there is only one man who can be Stephen Hawking. It is this that the documentary really capitalises on because the medium allows Professor Hawking himself to take centre stage as the narrator. Having Stephen Hawking recount his own history adds a great authenticity to the film. In describing events he is sometimes understated and at other times excitable, his passion for science and gratitude for the opportunities he has had somehow breaking through his monotone mechanical vocaliser. You don’t get the sense that he is being unguarded but he does appear to be telling it honestly. He clearly enjoys his fame and while I think he does consider himself one of the smartest people on the planet, I didn’t get the impression that there was any ego here. Being known for what you cannot do as much, if not more, for what you can is no doubt a great humbler. Something else that comes through is the man’s sense of humour. This is emphasised towards the end in the discussion of a friendship he apparently developed with Jim Carrey (wouldn’t have predicted that one) but is best showcased in the occasional one liners in his voice over. They won’t work out of context so I won’t repeat them here but he is amusing and likeable company. I’ve read the book and believe me that’s funny. Of course the film is moving too as any story of someone coping with such a horrifically crippling disability will always be. The shots of Professor Hawking experiencing zero gravity, briefly freed from his disability definitely made me well up. The over riding impression though is of an incredible man leaving an indelible mark on the world. Make no mistake about it, Stephen Hawking is one of our greatest surviving historical figures, coming up with scientific theories in his early 20s to genuinely rival those Darwin originated when he was twice that age. His story is one that should be seen. 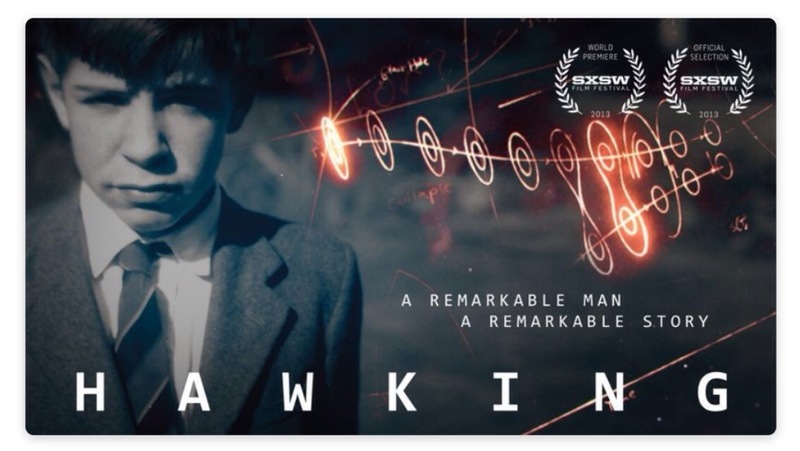 Hawking is in cinemas and on download now. The film has been rated PG for cinema release and while I can’t see many children nagging their parents to take them to see it, it presents a very positive picture of disability as well as an easy to swallow introduction to some of the most important scientific theories of modern times. I watched parts of it with my twelve year old daughter which led to a very interesting conversation on both topics.